Manohar Lal Khattar's reaction came after Mr Kejriwal questioned the Haryana government for not being able to improve the condition of the state, and said that the "AAP has improved Delhi in just three years". AAP rejected claims made by Manohar Lal Khattar about stubble-burning being up by 50 per cent in Delhi. Haryana Chief Minister Manohar Lal Khattar on Saturday attacked Delhi Chief Minister Arvind Kejriwal and said that the AAP government has failed to control stubble-burning as it has increased to 50 per cent in the national capital. "As compared to last year, stubble-burning has declined to 40 per cent in Punjab and Haryana. But it has increased to 50 per cent in Delhi which has only 7,600-hectare agricultural land," he said. Mr Khattar's reaction came after Mr Kejriwal questioned the Haryana government for not being able to improve the condition of the state, and said that the "AAP has improved Delhi in just three years". AAP rejected the claims made by Mr Khattar about stubble-burning being up by 50 per cent in the national capital. Countering Mr Khattar's claims, AAP Chief Spokesperson Saurabh Bharadwaj said that government of Haryana and Punjab have been blamed by several independent studies and not just Delhi government, for its rampant stubble-burning. "Every independent study has blamed the governments of Haryana and Punjab of creating death chambers around North India," Mr Bharadwaj told IANS. Mr Khattar said the AAP government proposed to open thousands of Mohalla Clinics for providing primary health care to the community but they have become "halla" clinics. Hundreds of Mohalla Clinics have turned into cow barns. Some of these centres are also used as parking spaces or for running barber shops, he said. Mr Bharadwaj, on the other hand, said that the main issue is not about comparing Haryana and Delhi. "But there should be a comparison between Khattar Government and Kejriwal Government," he said. "We welcome Mr Khattar to send his own delegation to Delhi and compare the Health and Education sectors of the two states. We would be happy to help Haryana government in improving their health and education sectors," Mr Bharadwaj said. 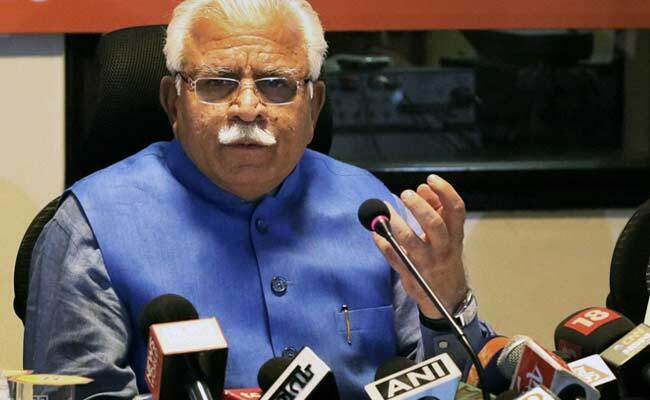 "You (Kejriwal) cannot compare Haryana with Delhi," Mr Khattar said. Alleging that Mr Kejriwal keeps changing his statements, Mr Khattar said when Mr Kejriwal was in Delhi he said Delhi has the right on the water of the Satluj-Yamuna Link Canal, when he was in Punjab he said Punjab has the right on the canal. Mr Khattar said that out of the total 176 promises made in the BJP election manifesto, 160 have been fulfilled and more initiatives will be taken soon.